The holiday season is officially in full swing and with that comes gift shopping galore, and of course Holiday Gift Guides. I had an extra special time curating my gift guide this year and searching high and low for a mixture of inspired, affordable and festive gift ideas to share with you. I hope that you find something special amongst my ten must-have suggestions below and that it helps make your search for the perfect gift just a little bit easier this year. Wishing you a Merry & Happy EVERYTHING!! Barefoot Bubbly Prosecco ($10 for 750 ml) Since I am a girl who adores her bubbles, I thought it was the perfect place to kick off this years guide. Barefoot Bubbly Prosecco is an easy to drink, affordable and very easy to find bubbly that will make the perfect hostess gift this season. I’m rather finicky about my bubbles and am rather surprised at how finessed this budget friendly Prosecco tastes. It pairs beautifully with a wide variety of foods and has luscious tree fruit aromas like pear, apple and peach and a lingering zesty lemon finish on your palate. Soybu Trish Scarf in Dragonfly ($42) I discovered Soybu this summer at BlogHer and totally fell in love with this high quality, on trend, beautifully designed lifestyle fashion brand. I loved it so much that I decided to partner with them for the next year to be among the first to preview their new collections and share them with you. For the holidays, I am LOVING their infinity scarf in Soybu’s to-die-for vibrant teal Dragonfly color. This scarf is made out of a yummy super soft slub cotton and designed with an open knit lace pattern that makes it lightweight and stylish. It will make the perfect gift for your girlfriends this season! 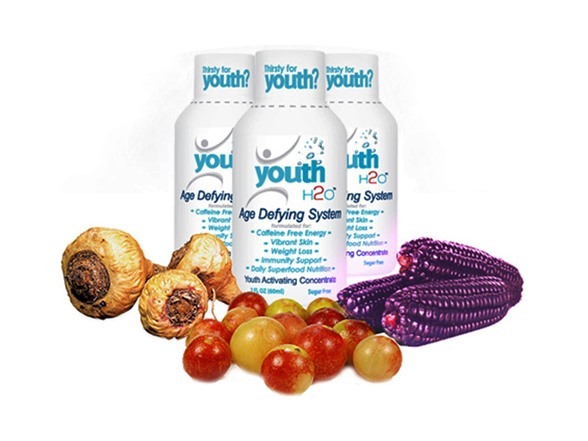 youthH2O Age Defying Daily Superfood Beverage ($32 for a month supply) is an all-in-one caffeine-free Superfood nutritional supplement that helps fulfill all of your wellness needs in one shot and it’s the perfect antidote to the stressful holiday season. It’s made with three powerful age defying organic superfoods including maca which naturally gives you vitality and stimulates your ‘youth hormone’; camu camu which has the highest vitamin C source on planet and it boosts your immunity and makes your skin glow; and lastly it contains purple corn which has the highest source of antioxidants and it supports healthy weight loss. I’ve become obsessed with my daily shot of youthH20 and love how it gives me a gentle boost of energy, health and makes my skin glow! Neutrogena Rainbath Shower & Bath Gift Set ($14.99) I’m a longtime fan of Neutrogena Rainbath Shower Gel and love the new fragrances they come out with periodically, so I couldn’t pass up this super cute and totally affordable holiday gift set. This pack comes with an exfoliating bath pouf along with a Rainbath Shower and Bath Gel in the refreshing Classic scent of fruits, spices and herbs along with the Renewing Pear & Green Tea fragrance with a renewing and slightly sweet pear and green tea blend. What a fun & festive gift! Burke Williams’ 2014 Relax & Renew Holiday Gift Card Packages There’s no place like the relaxing serenity of Burke Williams Day Spa! I’m loving their nicely discounted holiday gift card packages available through December 31st. The Holiday Relax Package includes a 50-minute Pure Relaxation Massage or a 50-minute Spa-Style Facial and a 25-minute Salt or Sugar Glo for $169-$179 which is a $225 – $250 value depending on city. The Holiday Renew Package includes a 50-minute Pure Relaxation Massage with Hot Stone Enhancement, a 50-minute Spa-Style Facial and 25-minute Salt or Sugar Glo for $269-$289 which is a $367 – $387 value! PLUS each gift card package purchased includes a 3-day spa pass ($135 value) for YOU to enjoy as a nice bonus from Burke Williams. You give relaxation and you get relaxation, SWEET! Project Shoe ($175+) I’m totally obsessed with the beyond brilliant Project Shoe, an online destination that allows you to create very own, custom footwear using their state-of-the-art design tools. I discovered this fabulous make-me-a-shoe-designer site at Kari Feinstein’s Emmy’s Style Lounge while I was scouting for new and inspired brands to blog about earlier this summer. The way the site works is simple: You start with one of their 12 base shoe models and then you add your preferred design elements utilizing an array of high quality materials, patterns, colors, and adornments. Do leopard heeled platform pumps tickle your fancy? Want to add a peep toe, no problem! Imagine giving your fashionista girlfriend the gift of being her own shoe designer, pretty FAB right?! Keurig 2.0 K550 Features ($199) Do you have a coffee luvah on your gift list? If you do, than I highly rec checking out Keurig’s new 2.0 K550, it’s definitely a must-have gift this season! This Keurig 2.0 features ten brew sizes ranging from a cup to a carafe – the new tech allows the system to recognize the size based on the pack you insert, an extra-large 80 ounce water reservoir, a large color touch display, programmable controls, an auto brew option, a strength control setting for brewing bolder coffee, customizable night light and wallpaper, and hot water on demand. Keurig has really upped their game with this one, it’s become a staple in our household! Big Buddha Grayson Hobo Bag ($95) Big Buddha bags are fashionable, versatile and incredibly well made at an affordable price. I adore Big Buddha bags because they wear extremely well over time and I’m loving their Grayson Hobo bag this season. 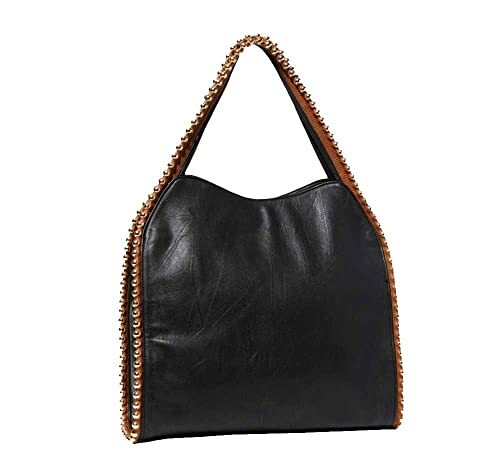 This bag is roomy, stylish and I love the gold studded detailing. It will make a fabulous holiday gift for the accessories lover in your life! Limited-Edition Restorsea Holiday Radiance Set ($315) Restorsea’s Day Cream is one of my all time favorite anti-aging moisturizers, my skin just laps it up, so I was thrilled to stumble across this to-die-for holiday gift set. 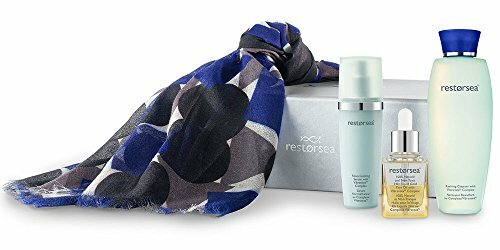 Restorsea partnered with Zero + Maria Cornejo in creating this stellar beauty-meets-fashion gift set, and Maria designed this gorgeous geometric print scarf to reflect the brand’s aesthetic. The Radiance Set includes: a Zero + Maria Cornejo Italian virgin wool scarf, Restorsea’s fab Reviving Cleanser, Renormalizing Serum and their new 24kt Liquid Gold Face Oil. This is skincare and luxury at it’s finest, gift it to someone special who wants to transform their skin. JustFab Safiya ($39.95) I’m constantly amazed at the array of on-trend, fun and affordable shoes by JustFab. Their boot selection this season was dizzying, but the faux suede Safiya boots stole my heart. These must-have black leg-lengthening covered wedge boots are especially chic and stylish with their contrasting gold zipper. And since I tend to have a hard time with taller boots fitting my wide calf, I was thrilled to see that this boot (and many others on JustFab) comes in a regular and wide calf options. Whether this boot catches your eye or another shoe does, JustFab has a plethora of options and is a great destination for the Imelda Marcos on your gift list. It's time for my annual holiday gift guide! I've been searching this years offerings to vet my top ten. Hope you find a fab present for someone special!